Major upgrades and maintenance projects were performed at our Putney Study Plot and the St. Paul Ski Lodge Base Station during the late summer, improving our radio telemetry system signal strength and enabling hourly polling of all the study sites. Additional opportunities to present the results of our dust-on-snow research were pursued, with our colleague Tom Painter and Andrew Barrett. In mid-winter, we were honored to host a fantastic opportunity for a small group of graduate students and researchers from all over the country to learn, hands-on, some very high-tech new techniques for snowpack characterization from a visiting Swiss scientist, perhaps the pre-eminent researcher on these methods. Our dust-on-snow monitoring program continued and found some quite unusual snowpack surface conditions. Thanks to a substantial, lingering snowpack, a field class from Great Britain had a very successful 10-day experience using our lower Senator Beck Basin Study Area terrain. 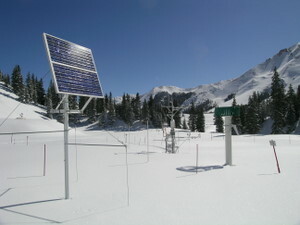 Even in early June, participants in the MTNCLIM conference held here in Silverton were able to observe extensive dust-on-snow conditions throughout the state, and we had the opportunity to describe the Senator Beck Basin Study Area to a large audience of scientists and agency personnel interested in how climate change is already disturbing and will continue to affect mountain systems. CSAS Presents Talk on Mountain System Monitoring and Research Synergies at MTNCLIM 2008, held in Silverton June 9-12, 2008. 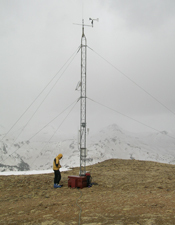 CIRMOUNT, the Consortium for Integrated Climate Research in Western Mountains selected Silverton, Colorado as the site for its bi-annual symposium on the effects of climate change in western mountains, MTNCLIM. The meeting was facilitated by Mountain Studies Institute. CSAS hosted a field tour of the Swamp Angel Study Plot and Senator Beck Stream Gauge monitoring facilities, and convened a monitoring working group session. 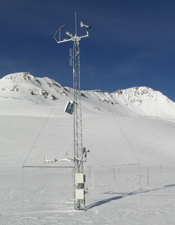 Dust-on-Snow Research Published. Our dust on snow research team, led by Dr. Tom Painter, now at the University of Utah, recently had our first peer-reviewed article on the project’s results published in Geophysical Research Letters, by the American Geophysical Union. Landry Presents Dust-on-Snow Research Findings to the Joint Agriculture and Resource Committees of the Colorado Legislature, Sen. Jim Isgar and Rep. Kathleen Curry Co-Chairs, at the State Capitol on February 27, 2008. Dust-on-Snow Talk to the Law of the Rio Grande Conference, Albuquerque, New Mexico on January 25, 2008. Center for Snow and Avalanche Studies and Senator Beck Basin Study Area Featured in Talks and Posters at the American Geophysical Union Fall Meeting in San Francisco in mid-December, 2007. Landry Presents Talk on Snow Albedo Measurement Refinements. 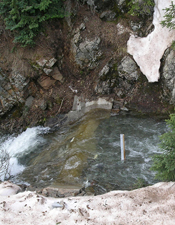 Colorado Water Congress Hears to Dust on Snow Story at their August 2007 Summer Convention. St. Paul Ski Lodge Radio-Telemetry Base Station Moved to New Mast. Putney Study Plot Tower Gets Makeover.